thus establishing thermal equilibrium between the matter and the radiation field. In effect, the plasma is opaque so that the radiation field acquires an accurate black-body spectrum (as observed). As long as the rate of collisions between electrons and photons remains large the radiation temperature adjusts to that of the matter and equilibrium is preserved because matter and radiation are in good thermal contact. Image credit: James N. Imamura of University of Oregon. Eventually, however, the temperature falls to a point at which electrons begin to bind with protons to form hydrogen atoms. When this happens the efficiency of scattering falls dramatically and as a consequence the matter and radiation temperatures are no longer coupled together, i.e. decoupling occurs; collisions can longer keep everything in thermal equilibrium. The matter in the Universe then becomes transparent, and the radiation field propagates freely as a kind of relic of the time that it was last in thermal equilibrium. We see that radiation now, heavily redshifted, as the cosmic microwave background. So far, so good, but I’ve always thought that everyday analogies are useful to explain physics like this so I thought of the following. When people are young and energetic, they interact very extensively with everyone around them and that process allows them to keep in touch with all the latest trends in clothing, music, books, and so on. As you get older you don’t get about so much , and may even get married (which is just like recombination, not only that it involves the joining together of previously independent entities, but also in the sense that it dramatically reduces their cross-section for interaction with the outside world). As time goes on changing trends begin to pass you buy and eventually you become a relic, surrounded by records and books you acquired in the past when you were less introverted, and wearing clothes that went out of fashion years ago. 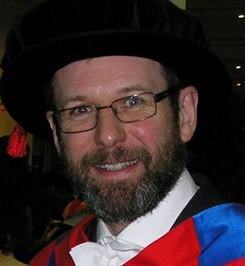 Decoupling explains the state of Prof. Coles’s clothes. 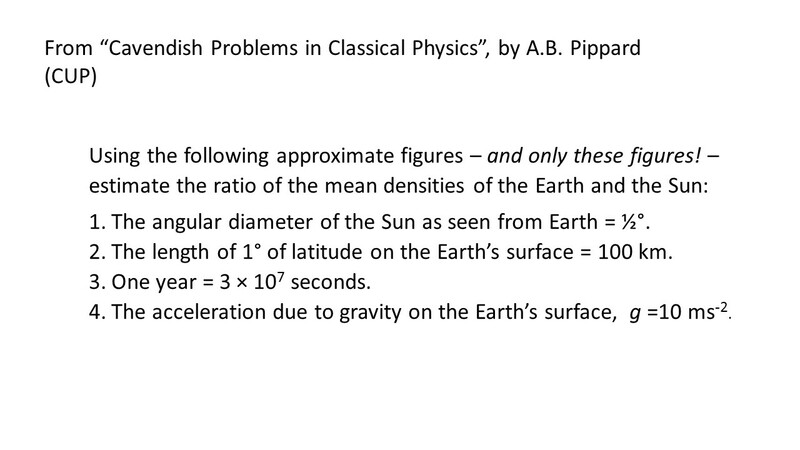 I spent quite some time this morning going over some coursework problems with my second-year Physics class. It’s quite a big course – about 100 students take it – but I mark all the coursework myself so as to get a picture of what the students are finding easy and what difficult. After returning the marked scripts I then go through general matters arising with them, as well as making the solutions available on our on-line system called Learning Central. Anyway, this morning I decided to devote quite a bit of time to some tips about how to tackle physics problems, not only in terms of how to solve them but also how to present the answer in an appropriate way. 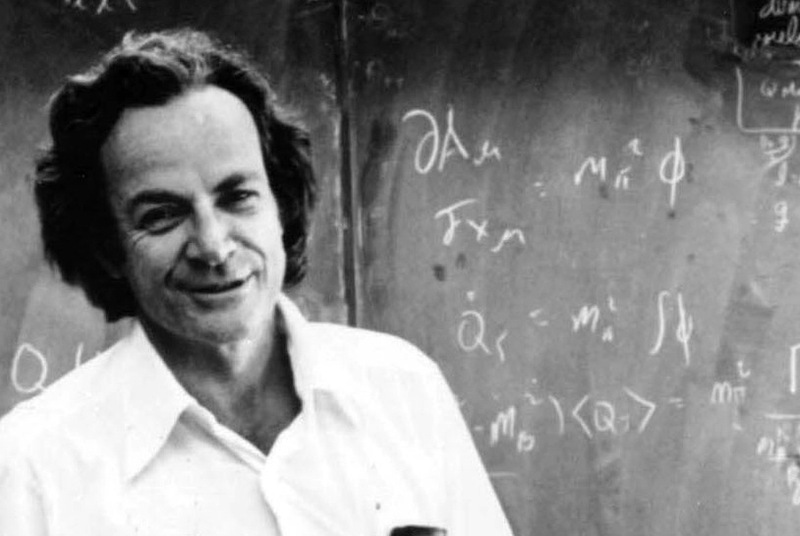 In this context, Feynman’s advice is the key to the first step of solving a problem. When I give tips to students I usually make the first step a bit more general, however. It’s important to read the question too. The middle step is more difficult and often relies on flair or the ability to engage in lateral thinking, which some people do more easily than others, but that does not mean it can’t be nurtured. The key part is to look at what you wrote down in the first step, and then apply your little grey cells to teasing out – with the aid of your physics knowledge – things that can lead you to the answer, perhaps via some intermediate quantities not given directly in the question. This is the part where some students get stuck and what one often finds is an impenetrable jumble of mathematical symbols swirling around randomly on the page. Read the question! Some solutions were to problems other than that which was posed. Make sure you read the question carefully. A good habit to get into is first to translate everything given in the question into mathematical form and define any variables you need right at the outset. Also drawing a diagram helps a lot in visualizing the situation, especially helping to elucidate any relevant symmetries. Remember to explain your reasoning when doing a mathematical solution. Sometimes it is very difficult to understand what you’re trying to do from the maths alone, which makes it difficult to give partial credit if you are trying to the right thing but just make, e.g., a sign error. Finish your solution appropriately by stating the answer clearly (and, where relevant, in correct units). Do not let your solution fizzle out – make sure the marker knows you have reached the end and that you have done what was requested. So anyway that’s my bit of “reflective practice” for the day. I’m sure there’ll be other folk reading this who have other tips for solving mathematical and scientific problems, in which case feel free to add them through the comments box. I sneaked into the department this morning to pick up some things from the office and leave some other things that I’ve finished with. I went quite early, to avoid the Saturday crowds there and back. One of the things I found in my pigeonhole was a packet of student questionnaires about the third-year module Nuclear and Particle Physics for which I was responsible. It seems like a decade since I finished teaching it and marked the exams, but it can only be a couple of months. I was dreading reading the responses this time because I know I struggled a bit with this module, partly because it’s the first time I taught the Nuclear Physics part and partly for other reasons I won’t go into. In fact the students were very kind and gave me quite good reviews; the only score that let me down really was that they thought the material was rather difficult. I’m not really surprised by that, because I think it is. However, as I’ve said before, I don’t think it’s a physics lecturer’s job to pretend that the subject is easy; it is a lecturer’s job to try to convince students that they can do things that are difficult. I don’t mean making things difficult just for the sake of it, but trying to get the message across that a brain is made for thinking with and figuring difficult things out can be intensely rewarding. The main criticism that students wrote in the space provided for their own comments was that they didn’t like the fact that I used powerpoint for some lectures. Actually, I don’t like using powerpoint for lectures either, but unfortunately I had no choice on some occasions. First I had a rather large class (85 students) and one of the rooms I had to use had a very small whiteboard; I was worried about its visibility from the back and the need to keep cleaning it every five minutes. Also in that room the projector screen covers the same area as the whiteboard, so it’s a pain to keep changing between powerpoint and whiteboard. Anyway, it’s a fair criticism. I’ll try to work out a better way of doing it next year. To be perfectly honest I don’t like whiteboards much either. Call me old-fashioned, but chalkboards are much better. Received wisdom, however, is that we have to have whiteboards, with all the ludicrous cost and environmental unfriendliness of the accompanying dry-wipe marker pens. But I digress. Anyway, next Wednesday afternoon will see our graduation ceremony. Graduation day always reminds me of something somebody told me years ago when I attended my first one, at Queen Mary (and Westfield College, as it was then). The essence of the comment was that what you have to remember as a lecturer is that when the students do well it’s their achievement; but when they don’t it’s your fault. Life’s like that, it’s never as symmetrical as particle physics. Many of the students who took Nuclear and Particle Physics will be graduating on Wednesday. I’m distraught that I won’t be able to go myself; this will be the first ceremony I’ve missed since I moved here five years ago. If any of the graduating Physics class from Cardiff University happens to read this, I really hope you have a great day on Wednesday. I wish I could be there to shake your hand and wish you a very fond goodbye, but sadly that’s just not possible on this occasion.